I find the contents of my purse to be ever evolving according the time of year as well as my current needs. These are five products in rotation at the moment that make me feel better prepared for when I'm out and about. And yes I have been toting these items in my recently acquired Truffle Clarity Clutch which I adore. Squelch is a natural, scentless odor remover. This wasn't a product I thought I needed until I tried it out. 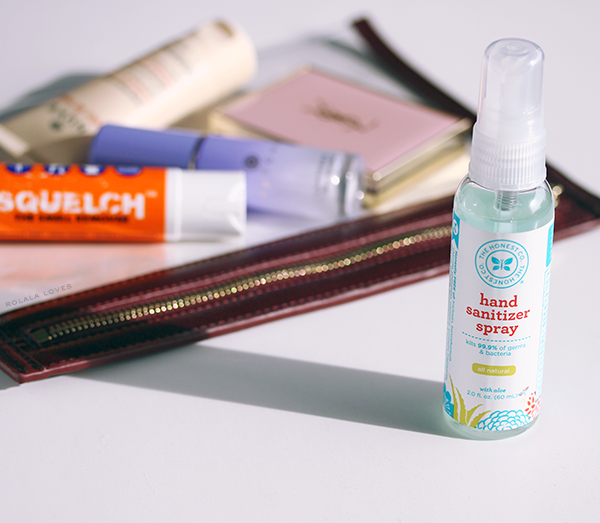 It comes in this convenient and portable spray and is great for any multitude of uses like freshening up my clothes, bag or even hair when I'm on the go. Korean BBQ happens to be one of my favorite meals but the scent it leaves behind on everything can sometimes be a little overwhelming and pervasive. With Squelch, I can indulge and easily spritz away the odor instead of feeling self conscious that everyone on the train will know what I just ate. It's safe and effective and I like how it actually removes odors instead of just masking them. 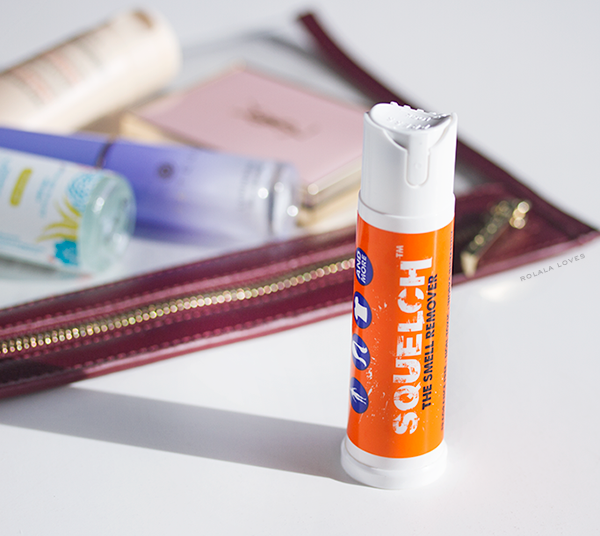 It doesn't stain and is really affordable so you can also easily stash a spray at home, work and in your bag. I always have some kind of hand cream in my bag because I hate to have dry hands after washing them outside especially during the winter months. I look for hand creams that provide long lasting hydrating without feeling greasy and this one does just that. I didn't care for the scent at first but I quite like it now. Hand sanitizer is a must because germs are everywhere. This plant based one comes in handy spray form and doesn't contain tricolsan (an active antibacterial ingredient that has been found to be unsafe) or parabens. It gets the job done without leaving my hands sticky or super dry. The first time I ever saw skin mists in action was in Korean dramas and everyone in those has the most flawless skin even the guys. Since trying my first facial mist, I get it. This one from Tatcha is my current favorite and not just because the bottle is gorgeously luxurious. The spray itself is refreshing and amazing for boosting hydration and imparts a lovely dewy finish. The only thing I don't like about this product is probably the price. If I may confess, I might have bought this because of the truly stunning compact but I actually love the blur perfector as well. It's a wondrous balm to kind of powder product that actually makes my skin look smooth and poreless. I actually use it lieu of powder as it cuts shine without drying out my face. And since it doesn't disturb existing makeup, it's perfect for touch-ups. Do you carry any of these products? What are some of your purse essentials? Disclaimer: This post is sponsored by Squelch in conjunction with the Out of Office NY Network. A press sample was sent for review but all opinions and words are my own. Thank you for supporting the brands that support this blog. I need to get Squelch! What a fabulous product to eliminate food odors! I love YSL beauty products. I've never tried their blur perfector. Definitely going on my list. Great post Rowena! A hand cream and a lip balm are my essentials. But maybe I should add in a odor eliminating product as well. Same here, I always have hand cream with me. The Rêve de Miel one must smell sooooo nice! Also, I totally want to try that YSL Blur Perfector now. YSL is awesome great essential you carry. Would love to try the mist :) All great things! im sold with squelch. off to get some now!! 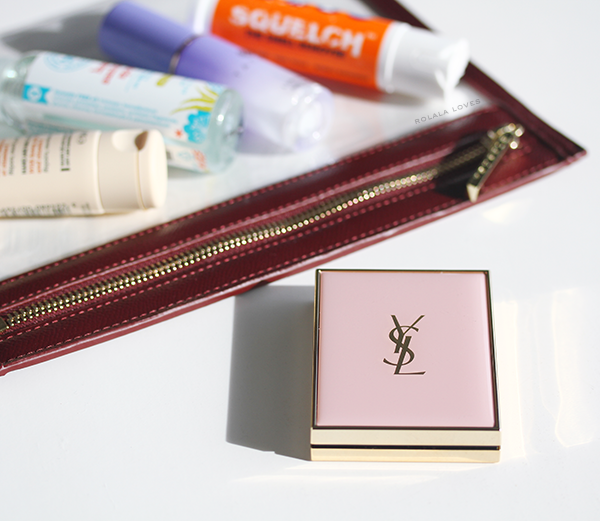 I carry all of the above but by different brands, but I am now curious about the YSL perfector. Right now I use CT for touch up's and it is great but this compact looks so elegant and chic *sigh* Aren't face mist the best! Happy hump day, Rowena. I have always love reading what others carry in their bags so this was a great read, Rowena! 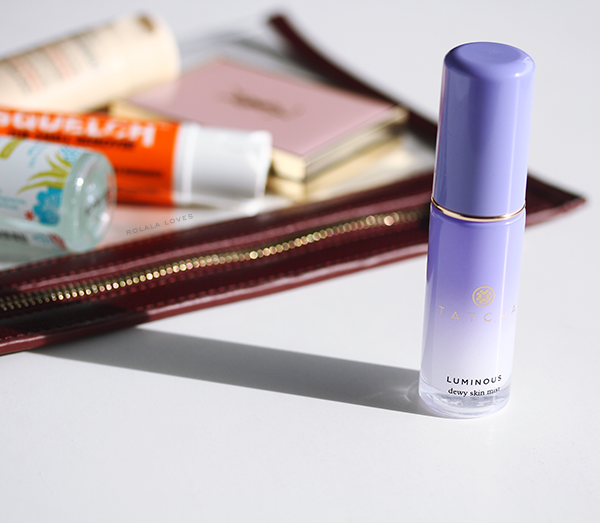 I have seen quite a few bloggers loving that Tatcha Skin Mist but it's so pricey, well Tatcha is a pricey brand but I really want to try the skin mist to see what's the fuss all about. Such a great essentials to carry Rowena!!!! I'm really curious about that scent remover...I don't think I ever tried a scent remover before ....and that one seems really practical ! it is great it is senseless and doesn't leave any marks. I usually carry a hand cream with me at all times, especially in Winter. I often buy Afrodita's hand creams (Slovenian brand) but at the moment I need a new one, so I just carry a small package of Nivea with me. I don't usually carry a saniter spray with me, I don't even have one but I usually carry a small package of wet wipes or sanitary wet wipes with me. You always show us interesting and useful products that usually I've never heard of. The odor remover spray is genius! 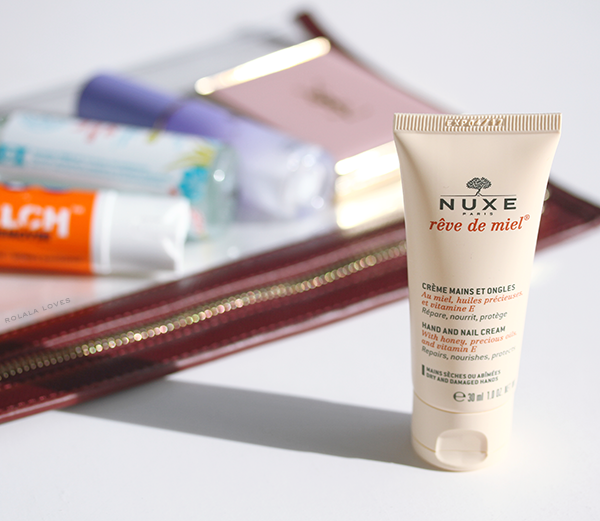 I want to try the Nuxe hand cream as well. PS So cannot wait for the new Sherlock season too, Rowena:) I loved that Christmas special. So great to see the two again! That Squelch product sounds like a winner, I've not heard of that brand. The content of my handbag does change with the seasons too, but I think that is normal. I keep hand sanitizer in my bags, currently love Dr. Bronner's travel-size bottles. Thanks for sharing. The YSL blur perfector and the hand sanitizer spray both need to get in my bag ASAP. I really like the idea of a spray version for sanitizer. These sound like great essentials! I want to try Squelch! You have some amazing goodies in your purse, Rowena. I have the Honest Hand Sanitizer. Don't know if it really kills germ but it leaves a nice feel and such refreshing clean scent. I want to try other stuff you have here. Never thought about having a small tube of hand moisturizer in my purse but that's a great idea especially during winter months. The products look great, especially the YSL Touche Eclat but my most favourite item is the clutch!!! Great products! Squelch sounds awesome. I need to check it out as my kids are always complaining about odors when we're out and about. And the YSL Touche Eclat Blur perfector compact is so pretty and useful, I'll be adding that to my list as I'm a fan of YSL. The clutch is fabulous, and I need to check out the hand sanitizer! I never really used to use hand creams not sure why since my skin is so dry. But now I always carry one with me. The YSL Blur Perfector sounds interesting! Ooo that IS a great compact. I will have to look in to it, the winter is doing a number on my skin. This is great! For me, hand sanitizer and lip balm is my must haves! Squelch sounds really interesting! I know what you mean about not wanting to smell like your last meal! I've gotten a few Tatcha products and need to try them soon! I enjoyed reading about your purse essentials and hand cream and sanitize is a MUST for my handbag! Lip balm and hand sanitizer are a must for me. nice essentials. Squelch sounds amazing!I don't think we have anything like that in the UK! This is a great list, especially because it makes me discover many new brands and products! I would love to give that facial mist a try - that's definitely something my poor skin could use in winter! And the Squelch product sounds intriguing, too, especially for those weird food smells that always get attached to my clothes and hair! Thanks so much for the inspiration, sweetie! Have a lovely Friday!